When imagineering revamped Tomorrowland in 1994 they included one of the real hidden gems of the Magic Kingdom, Sonny Eclipse. Performing a 25 minute show on an almost continuous loop at Cosmic Rays Starlight Cafe, Sonny brings a wonderful whimsy to an otherwise austere section of the park. 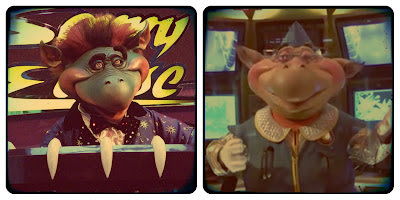 In order to get more bang for their buck, Sonny's animatronic was made from a model of Captain ZZZYXX, from the Star Tours attraction at Tokyo Disneyland. The captain is a Zorkie, like Sonny, and is indeed Sonny's cousin. Unlike Sonny who is from Yew Nork City...ZZZYXX is from Joo Nerzey. I love details like this! I hope Captain ZZZYXX and Sonny keep in touch. :) I also sure hope to get to Tokyo Disneyland and DisneySea someday.